If you'd like to make your own wine glass flags, I've made a printable template. 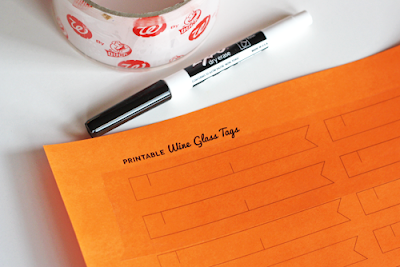 Print the PDF at 100% onto solid or patterned paper, cut out the tags, and wrap them around glass stems using the slits to secure them. Each guest could grab a tag and write their name on it. Or you could open the PDF in Adobe Illustrator, if you have it, and type names or messages yourself. Or open it in Adobe Reader and use the Typewriter tool. If you want water-resistant tags that might survive a few parties, laminate your sheet of paper with strips of packing tape on the front and back sides and provide a dry-erase pen for guests' names. Download the template file right here. I'll post an alternate design tomorrow. Love this, my mother and I have been trying to find non-obnoxious wine-glass tags for a while now. These are pretty cute. What a GREAT idea!!! I luv it! You are brilliant! No tape, easy solution. Another tip that I saw recently and loved was....paint the bottom of the glasses with blackboard paint and the you can write what you want when you want. Blackboard paint comes in all sorts of colours now too. Wouldn't it just be easier to cut it out of post-its? I suggest different collors for tags. Collor is more distinctive than different names written on tags which are all the same collor? Please don't mind, Jessica . But your posts are getting increasingly boring. I was (still am) a regular reader and I don't feel like coming back and checking what you have updated. The round-ups aren't brilliant either (but , that's my opinion). I think it's a great idea and I did something similar for my birthday party last weekend! :) Thanks for sharing. Your blog is a great source of inspiration as always!!! Thank you so much for this post. I want to let you know that I posted a link to your blog in CBH Digital Scrapbooking Freebies, under the Page 2 post on Mar. 06, 2012. Thanks again. I think that if you can't say something nice.....don't waste your time saying anything! This is such a simple idea, and has such great impact. This is going to save my next party from "wasting" too many glasses! This is such a great idea. I've seen many cute wine glass charms, but really, I think they are a bit over the top. I like your idea much better, particularly the customizable paper option. Thanks for the great printable and tips! Oh that was a clever idea! I made wine charms for our wedding http://blog.mummybrain.com/2012/02/tutorial-wedding-favour-wine-glass-charms.html but they are slightly harder, however we gave them away as favours. Brilliant idea. And free! Thank you so much. They are great, such a simple but effective idea! Thank you for this wonderful idea! My company is using it for a wine event we're sponsoring as a way to get our branding all over. Perfect! Love this idea, but I can't seem to type in the template - adobe says the creator must enable the typewriter tool. Can you help please :) ? In Reader, in the top menu go to Tools > Typewriter > Typewriter. Then click in the document wherever you want and start typing. To change the font, color, and size, pull up the Typewriter Toolbar, also available until Tools > Typewriter. To move your text around, select your new text box with the regular hand tool and drag. These are great! 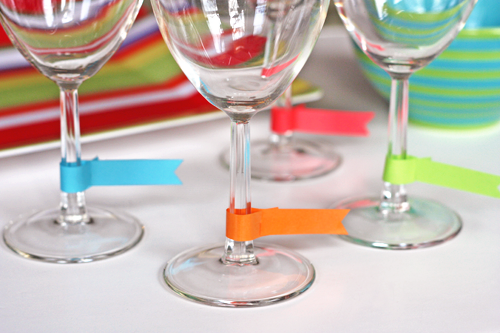 I've been looking for a more modern take on the wine glass tag and these are perfect. Thank you! Genius thank you so much !